A sinus-flushing device used to relieve colds and allergies has been linked to a deadly brain-eating amoeba. 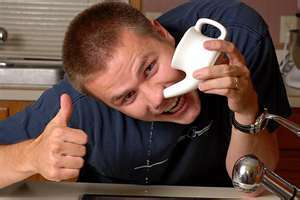 Louisiana’s state health department issued a warning about neti pots – which look like mini watering cans, that are used by pouring salty water through one nostril. It follows two recent deaths – a 51-year-old woman and a 20-year-old man from the ‘brain-eating amoeba’ Naegleria fowleri. It is thought the amoeba entered their brains when they used the devices. Both victims are thought to have used tap water, instead of distilled or sterilised water as recommended by the manufacturers. Dr Raoult Ratard, Louisiana State Epidemiologist, said: ‘If you are irrigating, flushing, or rinsing your sinuses, for example, by using a neti pot, use distilled, sterile or previously boiled water to make up the irrigation solution. La tap water linked to brain-eating amoeba not neti pots. La blames health care delivery system.. This entry was posted on December 18, 2011 at 7:33 am and is filed under Uncategorized. You can follow any responses to this entry through the RSS 2.0 feed. You can leave a response, or trackback from your own site.